The Perfect Meatloaf Pan is the new non-stick way to bake, lift and serve the perfect meatloaf. Just prepare your favorite loaf, place it on the custom-fitted air bake tray and pop it in the oven, when done out comes your delicious meal all at once! Easily lift, slide and serve without it ever falling apart. Thanks to a durable non-stick coating nothing sticks! The magic is the revolutionary air bake tray that elevates your meal so heat can circulate underneath and cooks evenly so you can have moist perfect meatloaf every time. Other pans force your meal to sit in fat making it mushy and undercooked. The Air bake tray ensures your meal to be cooked perfectly every time and without all that excess fat. Dishwasher safe so cleanup is a snap! 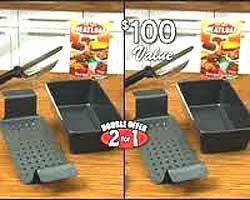 Order your Perfect Meatloaf pan today!